Saturday 11 May: - Toy & Rail Collectors' Fair at Horsted Keynes. Normal public trains also running to our Service Three timetable. Details of our 2019 special events and offers are available here. The Grinsteade Buffet Carriage at our East Grinstead station, and our Restaurant and Shop at Sheffield Park station are open daily, even on days when no trains are running. The only day through the year when the railway not open is Christmas Day itself! 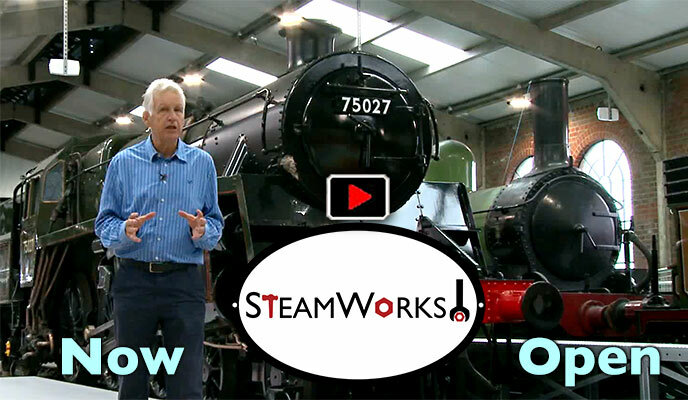 Through the winter, on days when trains run, the Locomotive Shed and the SteamWorks! exhibition at Sheffield Park Station will be open between 10am and 4pm. Click here for Museum opening dates and times. On days when no trains are running, the Locomotive Shed, the SteamWorks! exhibition and our Museum will all be closed. Book online and save on your train fare with our Bluebell Bonus tickets. Latest News and photos; What's New - Why not become a BRPS Member? Your ideal Film/TV location? - A great day out for all the family. For Children up to 8 we have the Stepney Club. The 9F Club allows older children to get more involved behind the scenes at the railway. Details of how we assist with School Visits to the railway - projects can contribute towards Key Stages 1 & 2 of the National Curriculum. 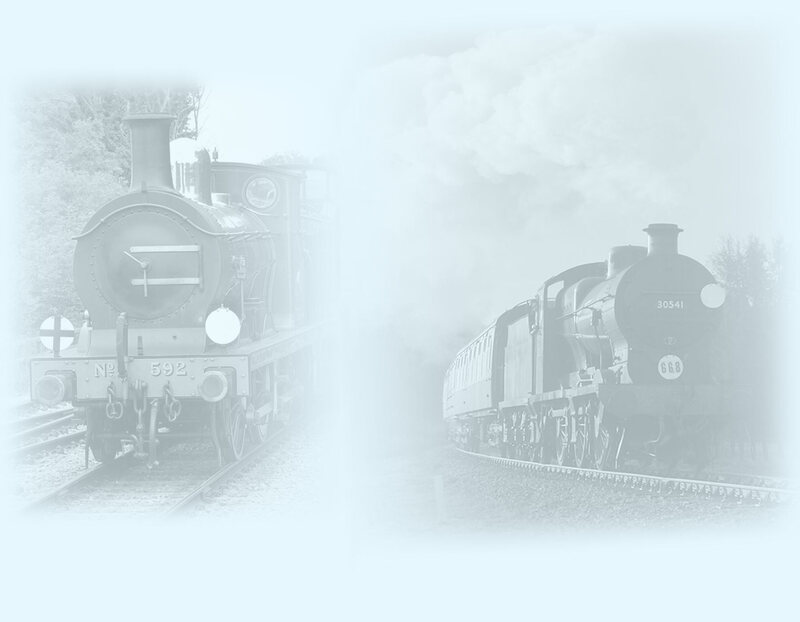 Two Bluebell Railway Screensavers are available for downloading to your PC. A steam train ride on the Bluebell is one of the top things to do with kids on holiday for a day out in Sussex (the line crosses the border between East Sussex and West Sussex, and is not far from Surrey). This heritage railway is close to Haywards Heath, Gatwick Airport, Uckfield, Brighton and Lewes, in the Ashdown Forest/Mid Sussex area of England. Your children will love to take our vintage steam rail trip during your vacation. On this web site you can find Visitor Information, and details of the Timetable showing the train times. In addition to scheduled passenger trains, there is also a wide variety of special offers, Pullman dining trains, Afternoon Tea trains, Fish & Chips, Rail Ale, etc., and in the run up to Christmas each year, the very popular Santa Specials where the children receive presents from Father Christmas, and a full programme of other Special Events. The web site contains much more that just this, though. Photo, above right, thanks to Andrew Strongitharm. 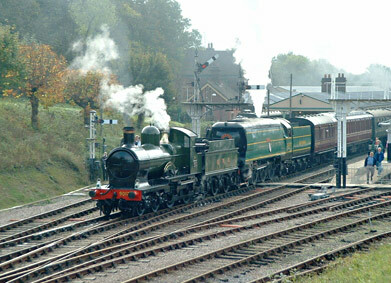 The unusual combination of a GWR "Dukedog" and an SR "West Country" depart northwards from Horsted Keynes station at the 2005 "Giants of Steam" gala. To view larger versions of most of the pictures on this site, just click on them. Contact information, phone numbers and addresses; and Who's Who. For younger members there is The Stepney Club and the 9F Club. All the latest news from the Bluebell. Pages detailing the History of the Bluebell Line. Pages describing the role of the Bluebell Railway in Carlton's TV film of "The Railway Children", and the rolling stock used in the film. The Bluebell Railway Trust (Registered Charity No.292497) and the Museum. Links to related pages, plus a Search Engine to help you find whatever you are looking for on the Bluebell web site or elsewhere on the Internet. The railway is operated by "Bluebell Railway plc", which is majority owned by the volunteer membership through the Bluebell Railway Preservation Society, and this membership also provides the dedicated volunteer labour which enables the line to continue running. Any financial surplus made from running the trains is ploughed straight back into preservation work. The only "dividend" members receive is the immense satisfaction of seeing "their" railway provide a day's entertainment for hundreds of thousands of visitors each year. Disclaimer: Whilst every care has been taken to ensure the accuracy of these pages, the Bluebell Railway cannot be held responsible for any errors or omissions. In addition any information or advice given on these pages is provided in good faith, but should not be relied upon for safety-critical applications. Bluebell Railway reserves the right to vary any of the provisions of this web site without prior notice. This website does not form part of any contract between the Railway and current or prospective visitors or customers. Those requiring information on specific matters should seek written confirmation from the Railway. Please email the web site editor, Richard Salmon, with any comments or suggestions about format or content. 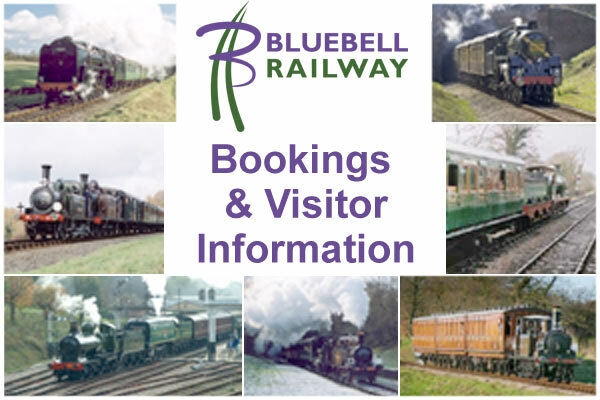 External links are provided in good faith, but the Bluebell Railway cannot be held responsible for the content to be found on other web sites. We do not share any statistical data on the usage of the site with other websites, companies or individuals. Cookies: This BRPS website (.co.uk) does not use or issue cookies. © Copyright of all items is retained. Material on this web site may not be reproduced (or further distributed beyond normal web access) in any form without the express permission of the Bluebell Railway or other copyright owners as appropriate. Some photographs are by the editor and the others are by Mike Esau, Ian Wright, Lewis Nodes, Jon Horrocks, Peter Richards, Hiroshi Naito, Mike Nichols, Michael Taylor, Jeremy Ovenden, Jon Bowers, the late Tony Dunkley, Robin Frankham, Nigel Kendall, the late Harold Roy Pettit, Peter Edwards, James Young, Jonathan Hall, Graeme Pettit, Martin Oakley, Barry Coward, Nigel Longdon, Jeff Machin, Tony Pearce, Ian Bowskill, Chris Majer, Adrian Lee, Anthony Goff, Tony Frost, Dave Bowles, David Harp, David Chappell, Les Anstey, Chris Gardner, Andrew Strongitharm, Paul Pettitt, Chris Dadson, Dave Clarke, Nick Beck, Simon Robinson, Owen Chapman, Chris Nevard, Dave Chambers, Martin Creese, Dave Stickland, Clive Emsley, Dave Smith, Fred Bailey, Robert Bird, Roger Stronell, Derek Hayward, Chris Ward, Tom Waghorn, John Sandys, Benjamin Boggis, Paul Sharpe, Brian Easter, Duncan Bourne, Stephen Hunt, Ken Upton, Neil Munro-Thomson, Bill Vigar, John Fry, Linda Chen, Matt Allen, Neil Glaskin, Ashley Smith, Kate James, Tom James, Nick Talbot, Ray Wills, Tracey Wheatley, Bryan Benn, Dave Devlin, David Haggar, Alan Bedford, Steve Fairweather, Keith Duke, Derek Forrester, Ben Coughlan, David Pratt, Rob Faulkner, Stephen Parker, David Warwick, Sean Tompsett, Thomas Newble, Keith Leppard, Clive Hanley, Phil Stoneman, Mike Snow, Andy Prime, John Jesson, Geoff Pethick, Dave Jefferys, Chris Majer, Peter Richards, Richard Thomas, Rebecca Parkes, Pat Plane, Ian Maggs, Martin Lawrence, Brian Lacey, Mike Hopps, Andrew Crampton, Julian Clark, Steve Lee, David Long, Mike Anton, Martin Malins, Mark Duhig, Tony Hillman, Paul Booth, Stuart Pay, David King, Robert Hayward, Nick Dearden, Jonathan Hughes, Phil Brown, David Chappell, John Goss, David Jones, Paul Furlong, Andy Kelly, Alex Morley, Brian Kidman, Tony Sullivan, Andrew Wood, Robert Else, John Ede, Peter Wilson, Alex Fisher, Alan Black, Julian Heinemann, Nick Burgess, Andrew Shapland, David Pool, Deiniol Willis, Yoshi Hashida, Kevin McElhone, Roger Cruse, Chris Pratt, Nicholas Woollven, Varsha Ratna and many more, with permission. Thanks are also due to Lewis Nodes, Matthew Cousins GRA, Gordon Dudman, Tony Hayllar, Jon Goff, Brucw Healey, Tim Baker, Tony Hillman, Peter Richards, Martin Nichols, Malcolm Roe, John and Robin Elliott, Peter Churchman, Graham Townsend, Mike Watts, Mark Smith, Roger Williams, Martin Lock, Michael Taylor, David Rider, Julian Best, Steve Gostelow, Geoffrey Snow, Jim Turtle, Roy Watts, Nigel Longdon, Kate Saker, Paul Sturm, Katsumi Suzuki, Hiroshi Naito, Geoff Harris, Martijn Huibers, Mark Armstrong, Peter Forrestier Smith, Jon Bowers, Martin Skrzetuszewski, Nick Beck, Blair Robinson, Ted Crawforth, Fred Bailey, Terry Cole, Robert Bird, Jon Elphick, Jan Kozminski, Caroline Collins, Duncan Bourne, Gary Smith, Nicholas Pryor, Chris White, Richard Green, Rob Faulkner, Avril Gaynor, John Jesson, Dave Clarke, Gavin Bennett and many other Bluebell members. Like so much on the Bluebell Railway, this web site is provided at minimal cost to the Railway thanks to voluntary effort. The search engine is advertising supported, provided by FreeFind, and the EasySearch facility even generates income for the Bluebell Trust. To search for a phrase, enclose it in quotes; e.g. "New Year"
To the Bluebell Web Sites' Entry Page, the Public / Visitors' web site, or the "What's New" page. This page last updated 8 April 2019 by Richard Salmon.